First, in most facilities postal management is automatically reverting (i.e. doing away with) vacant positions in violation of the contract. Job reversions reduce the workforce and slow or stop conversion opportunities for Postal Support Employees (PSEs) to career jobs. Second, management is targeting thousands of bid jobs currently occupied by career employees for abolishment. Third, job abolishments can lead to the excessing of career employees out of their facilities and possibly out of their crafts. Furthermore, PSE hours will be significantly reduced if management's ill-conceived actions are fully implemented. "Management's proposed plans will severely disrupt the lives of career and non-career employees alike. We are in a big fight," said President Dimondstein. "If we stick together and stay united, then I am confident that - just like with the Stop Staples and contract struggles - we will be victorious in stopping these new attacks on the workforce and on customer service." These actions by postal management are counter to the Postal Service's core mandate to "provide prompt, reliable and efficient services to patrons in all areas." 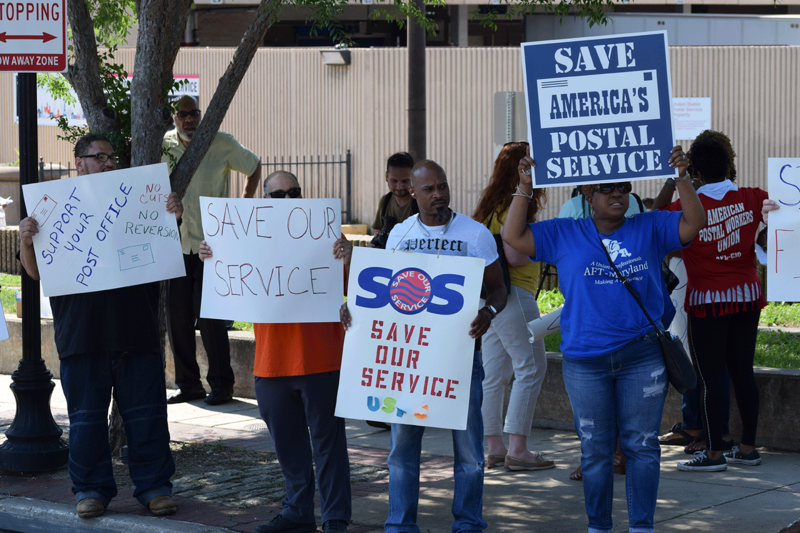 "The Postal Service's decisions will reduce employees at offices which are already short-staffed and where customers are experiencing poor service," said Clerk Division Director Clint Burelson. "Delays in the mail will increase and there will be longer lines at post offices." In response to these attacks on the postal workforce and service, APWU President Mark Dimondstein and NPMHU President Paul Hogrogian sent a joint letter to Postmaster General Megan Brennan voicing the unions' deep concerns. In the letter, the two presidents questioned "why the Postal Service would choose to declare war on its unions and its employees." "The cutting of an already skeletal workforce will not only cause massive disruption to the workforce but will cause further degradation of postal services for the American people throughout the country," the letter stated. Together, the postal unions drew a line in the sand and stood united against Postmaster Brennan's continuous "cost-saving" shortcuts. The presidents concluded by restating their commitment to work together, "Rest assured that, absent correction, the APWU and the NPMHU will together resist [the] misguided actions and violations of [the Postal Service's] agreements with, and commitments to, our members." The National Clerk Division Leadership organized a coordinated response to the serious contract violations, including provisions that management must create career bid jobs out of all available work hours. National officers conducted concerted training for local/state officers and stewards across the country (with plans to continue trainings, as necessary, moving forward). A Clerk Division National Business Agent (NBA) from each region is assigned to assist the local and state affiliates in filing grievances. The APWU headquarters leadership is preparing to file national grievances, as appropriate, and the five APWU Regional Coordinators will initiate appropriate area-wide grievances, as well. Now that the proposed excessing is delayed for five months, the APWU and postal management agreed to area wide meetings to fully discuss staffing and scheduling. "We welcome the opportunity to sit down and discuss these important issues," said President Dimondstein. "However, APWU representatives will vigorously oppose any unnecessary changes and seek constructive alternatives to management's slash and burn approach." Locals are taking their own initiative and getting out in the streets, educating and rallying their communities. On June 10, the Baltimore Francis "Stu" Filbey Area Local held an informational picket with over 70 members and supporters. Other locals are preparing similar actions to defend good services to postal customers. "All APWU members should stay informed and involved," urged President Dimondstein. "As we await new impact statements, any excessing is months away from becoming a reality. Furthermore, based on a previously negotiated settlement with the union, management cannot excess APWU represented career employees more than 50 miles. So, there is limited opportunity for postal bosses to currently force employees out of their facilities." If an APWU member receives an improper notification of an involuntary reassignment, contact your local/state union representative for assistance. Find out more information on the specific impact to your workplace and how to help fight back, at apwu.org, on Facebook and at local union meetings. To receive texts or emails directly from the APWU National Headquarters regarding this, and other important issues, click here to sign up or text "APWU" to 91990 for mobile updates.